San Jose, CA—November 21, 2017—Design preventive healthcare and continuous monitoring solutions for wearable health and fitness applications with the MAX86140 and MAX86141 optical pulse oximeter/heart rate sensors and the MAX30001 electrocardiogram (ECG) and bioimpedance (BioZ) analog front end (AFE) from Maxim Integrated Products, Inc. (NASDAQ: MXIM). Through compact, low power solutions, these devices enable accurate monitoring of vital signs to monitor wellness/fitness and prevent health problems before they even begin. Today’s continuous monitoring technology is shifting the consumer mindset away from a reactive monitoring approach to a proactive one. Rather than waiting for yearly doctor visits to get results for blood pressure and other vital signs, consumers want real-time information about the status of their health. This shift is causing an increased demand for accurate, small, and low-power wearable devices—an important enabler for this new way of thinking. As continuous monitoring and preventive healthcare become more common, both technology providers and health practitioners must embrace and accommodate these new demands to be successful. 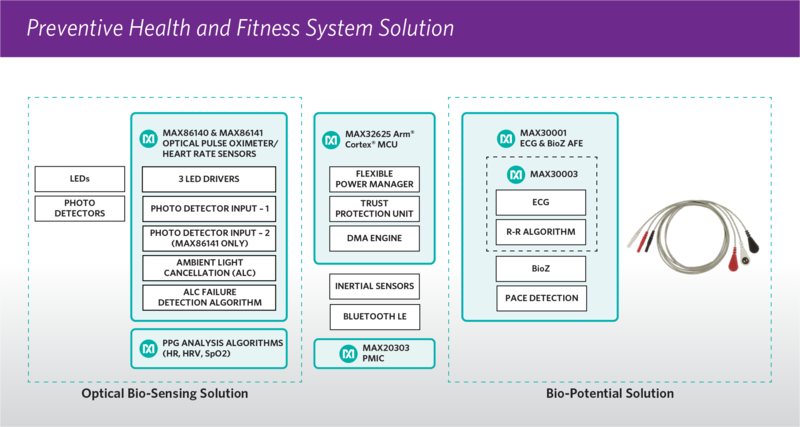 Maxim’s portfolio of sensors for wearable health and fitness applications allows consumers to accurately monitor a variety of key vital signs while being mindful of low power (for longer battery life) and small size (for convenience and comfort). 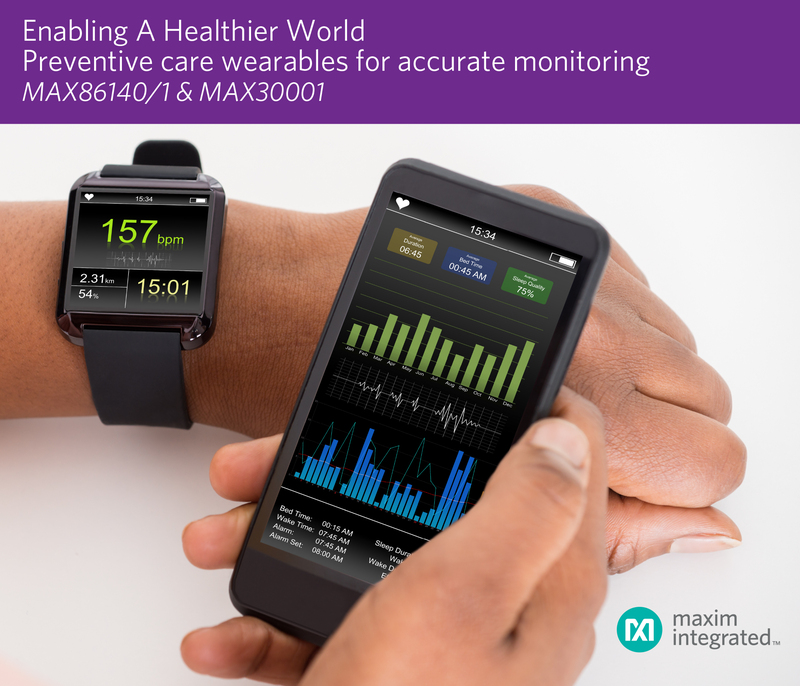 The MAX86140 and MAX86141 can be used to measure PPG signals on the wrist, finger, and ear to detect heart rate, heart rate variability, and pulse oximetry. The MAX30001 measures ECG and BioZ on the chest and wrist to detect heart rate, respiration, and arrhythmias. Compared to competitive solutions, the MAX86140 and MAX86141 require less than half the power and is approximately one third smaller, while the MAX30001 requires approximately half the power in almost half the size. By collecting beat to beat data about the heart, these solutions collect accurate data so users can recognize important symptoms when they first begin. In addition, the MAX30001 meets IEC60601-2-47, clinical ECG standards. “With unmatched power, as well as ultra-small form factor and high accuracy, our robust portfolio of sensor solutions will enable our customers to succeed in this market,” said Andrew Baker, Executive Director of Industrial & Healthcare at Maxim Integrated. This entry was posted on Tuesday, November 21st, 2017 at 9:53 am and is filed under Advertiser, News.